One of the advantages of incorporating charts into long-term investing analysis is the ability to visualize what has been going on with the stock, index, or ETF over time. Another advantage of using charts and technical analysis when researching long-term portfolio investing is to provide a faster method for finding and selecting stocks. Using industry and sector index charts is one way of helping to identify where the next generation of growth stocks are likely to be found. The use of the Industry Index chart also helps with decisions regarding mutual funds and other stock investment derivatives such as ETFs. Many investors find that studying industries first by using the index chart can eliminate many of the difficulties in focusing on where to invest. We use three Super Sector index charts (provided by TC2000, based primarily on Morningstar classifications): Cyclical, Sensitive, and Defensive. There are 11 sectors: Basic Materials, Industrials, Technology, Consumer Cyclical, Financial Services, Real Estate, Consumer Defensive, Health Care, Utilities, Communication Services, and Energy. Each sector is broken down further into specific industries. Some industries have less than 10 companies, while others have hundreds. Choosing an industry that has many companies is often a good place to start. There are 146 industries within the 11 sectors. One example is Biotechnology, which falls under the Health Care sector and has 486 companies as component stocks. These are listed stocks on the U.S. exchanges. Biotechnology has strong potential for future growth, with newly emerging technologies in many areas of science, the environment, and medicine. The Biotechnology Index chart provides a wealth of information on how this industry has been performing, and where it is in the industry business cycle. This is a line chart on a monthly scale (Figure 1). Source: Technitrader.com. TC2000 chart courtesy of Worden Bros.
Line charts are best for technical analysis of the long-term trend. The chart contains the index value represented as a continuous line, month over month. In addition, it has monthly volume and the cycle indicator known as the detrended price oscillator, which removes the trend from the value chart to reveal the industry cycle. 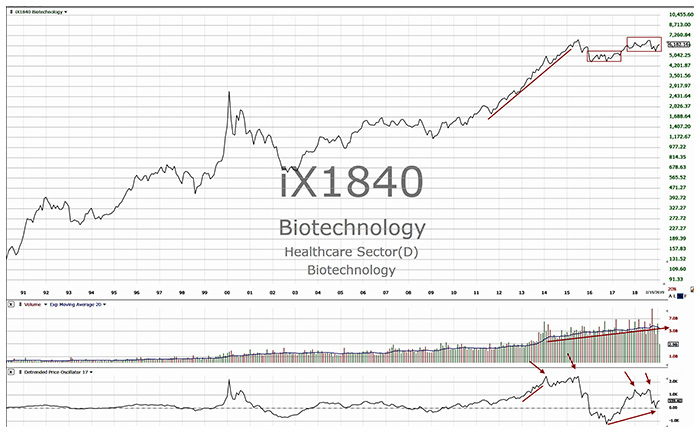 This Biotechnology industry monthly chart has 28 years of data. Currently, the industry has been in an industry-cycle correction mode. It started in 2015 as the industry cycle peaked with an extreme deviated peak in its cycle. This was due to massive speculative investing and trading in Biotechnology stocks between 2010 and the beginning of 2015. Stock prices went beyond what was warranted by fundamental values and financials of the companies. Technical analysis warned of the risk of a correction for many stocks in this industry. The correction is still underway, but there is improvement in the recent industry technical patterns. This is due to many bottoming formations that began in 2018 and are completing in 2019. Individual stocks within the industry appear to have quiet “accumulation bottoming,” which will show on individual stock charts first, and then later on the industry chart. There was an extreme trough pattern followed by a failure to top, and then recently a failure to trough. This means the industry has some companies that are stronger than others. The volume for this industry has been on an upward angle of ascent, even while it has been in a sideways price correction mode. This is due to continued quiet accumulation, likely by buy-side institutions and developers for ETFs. This chart provides ample information for investors, revealing that this industry should have many stocks that are in a recovery mode, with those bottoming formations developing at this time. The opinions expressed in this article are those of the author and do not necessarily represent the views of Hilbert Financial Group. These opinions are presented for educational purposes only. Like so many simplistic approaches to the financial markets, the efficient frontier fails to reflect market reality. To understand the investment efficient frontier, it helps to go back to its origin. In 1952, economist Harry Markowitz published an investment model that became known as modern portfolio theory. One elegant aspect of the model that transformed portfolio design was the development of an efficient frontier to balance risk and return. Markowitz looked at the effect of allocating percentages of a portfolio between bonds and equities. Graphed on a risk (standard deviation) and mean return basis, the result was a fishhook-shaped frontier that, based on historical data prior to 1952, showed a blend of 40% bonds to 60% equity allocation that produced a higher return at a roughly comparable risk level to a 100% bonds position. The “hook” is the element that makes the efficient frontier so intriguing. It clearly illustrates that a blend of stocks and bonds can potentially improve the risk-return balance of a portfolio—achieving higher returns than a conservative all-bond portfolio without substantially increasing risk, as measured by standard deviation. Figure 1 shows a portfolio composed of the Barclays Capital Aggregate Bond Index and S&P 500 Index allocated in 10% portfolio increments using mean/average standard deviations and returns over the 65-year period from 1950 to 2014. The circle indicates the point at which the portfolio is invested in 60% equity/40% bonds. 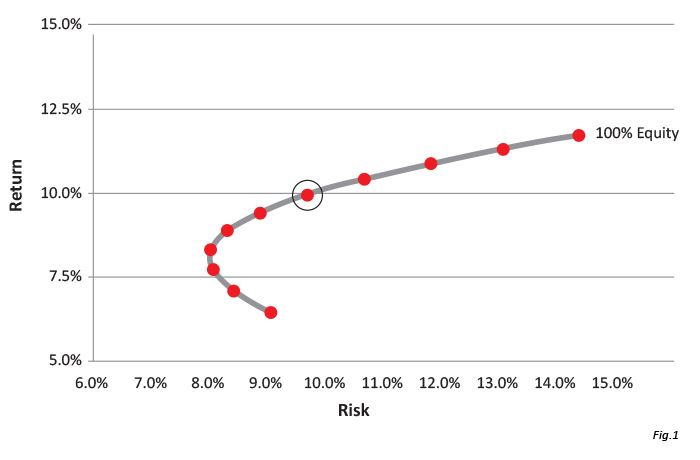 Risk for the 60/40 portfolio is slightly more than a 100% bond portfolio, but annual return has increased from 6.47% for the 100% bond portfolio to 9.95% for the blended approach, indicating a considerably more efficient portfolio in terms of risk-return. In Figure 1, it appears that Markowitz’s efficient frontier still holds true 60 years later. Or does it? The problem with the efficient frontier is that it is a moving target. If one looks at the frontier between bonds and equities over 10-year intervals, which is much more representative of the average investor’s time frame, the highest return for the lowest risk ranges from 100% bonds to 100% equity. That’s not very efficient. 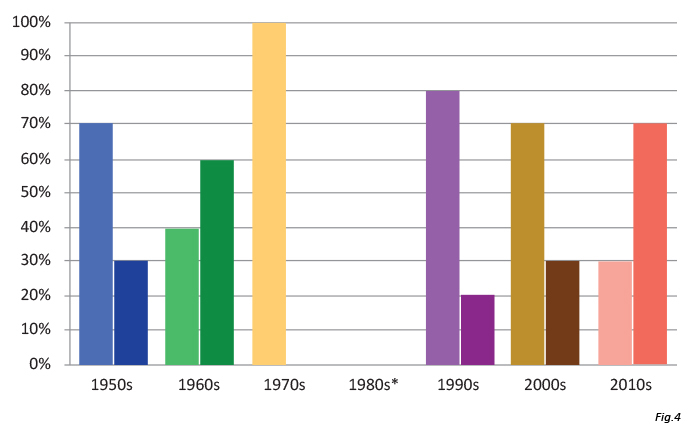 Figure 2 was first published by Rydex Investments and has been re-created by the research team at Flexible Plan Investments to encompass the period from 1950 through 2014. FIGURE 2: THE INEFFICIENT FRONTIER? Figure 2 depicts the efficient frontier of equity and bond portfolios illustrated in 10% increments. Equity returns are based on the S&P 500 Index, including the reinvestment of dividends. Bond returns include the reinvestment of dividends and are based on the Barclays Capital Aggregate Bond Index. Index returns do not reflect any management fees, transaction costs, or expenses. Standard deviation is used as a measure of risk. This is a statistical measure of the historical volatility of an investment, computed over each 10-year period. The higher the number, the more volatility is to be expected. Financial markets rarely fit the assumptions of mean-variance models. In decades that include a major bear market, bonds tend to outperform equities. In 1970-1979, the fishhook disappears as 100% bonds and 100% equity portfolios achieve roughly the same return but with equities at more than double the volatility. In 2000-2009, the fishhook is inverted and bonds dramatically outperform equities, moving the point of lowest risk/highest return to 70% bonds/30% equities. These discrepancies illustrate the problem with trying to use simplistic 60/40 portfolio designs and expecting a predictable return. Financial markets rarely fit the assumptions of mean-variance models. Fifty-plus-year averages almost always fail to match actual results of shorter periods. If the optimal portfolio is defined as one that achieves the greatest return with the least risk, there isn’t a single 10-year period that matches the 60/40 allocation. Each decade has a different “efficient frontier,” with the lowest risk/highest return portfolio varying as shown in Figure 3. Note: Lighter shade represents the fixed-income allocation; the darker shade is the equity allocation. 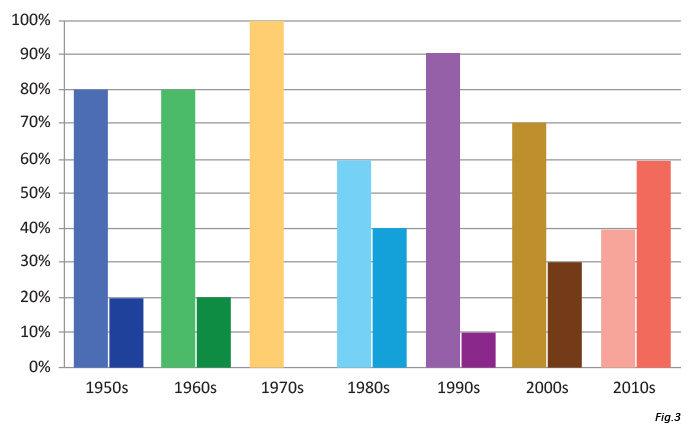 In the 1970s, 100% bonds and 100% equity portfolios achieved roughly the same return, hence only one column is shown. Another way to utilize the efficient frontier portfolio approach is to develop an allocation offering the maximum expected return for a given level of risk. 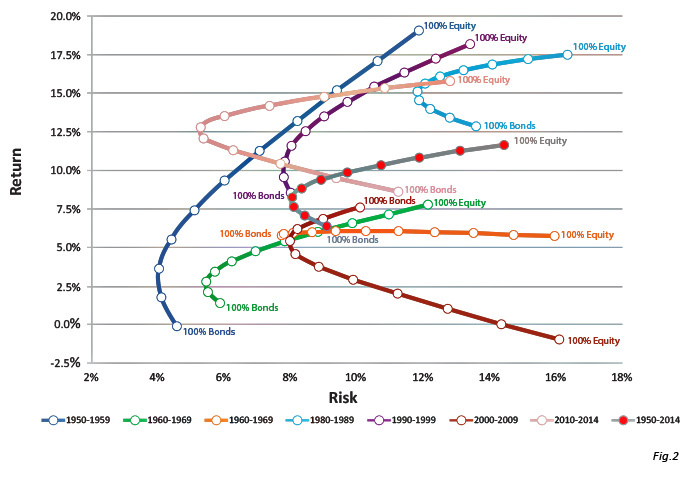 According to the efficient frontier’s traditional curve, using the 65 years of data from 1950–2014, the appropriate allocation is 70% bonds/30% equity at an 8% standard deviation risk level. Once again, each decade produces a different value for a portfolio with an 8% standard deviation/risk level. The 2010 decade actually offers two options: An 80% bond/20% equity portfolio has a roughly equivalent risk level to a 30% bond/70% equity allocation, as seen in Figure 4. Note: Lighter shade represents the fixed-income allocation; the darker shade is the equity allocation. *The 1980s were a particularly volatile decade with the lowest average standard deviation at 12.25%. Thus, no allocation would have met an 8% standard deviation. The lasting value of the efficient frontier concept is the fishhook curve. With the exception of the 1970s, when the curve flattens out, there is a point on each frontier where diversification reduced risk beyond that of the perceived lower-risk investment (i.e., bonds) and improved returns. The brilliance of Markowitz was his recognition of the potential for diversification to reduce portfolio risk without unduly depressing returns. However, he created the efficient market theory before computers and the multitude of investment vehicles were developed that allow today’s investment managers to slice and dice the market into endless allocations and change those allocations quickly and cost-efficiently. The market was in many ways much simpler: a world without instantaneous transactions, global influences, data-driven computer models, and the ease of analyzing and investing in a great number of investment choices. It is time to rethink the efficient frontier to accommodate new investment approaches to achieve reduced risk and improved returns. Today’s investment managers have the ability to go beyond simplistic formulas to create financial security for their clients by using investment approaches that take advantage of the enormous potential and flexibility of the financial markets. By developing allocations based on market conditions and incorporating the use of strategic diversification, today’s active managers can manage risk while dynamically optimizing portfolio allocations. This is where a total portfolio approach to active management comes into play. This article first published in Proactive Advisor Magazine on May 14, 2015, Volume 6, Issue 7. Are we looking for investment answers in all the wrong places? © Copyright - Hilbert Financial Group, LLC. All rights reserved.